KMS Bearings produces 2 Bolt Flange Blocks from PBT, a glass filled reinforced engineering polymer, that will never corrode or rust. When inserted with a KMS UHMW Insert sleeve bearing, they provide superior corrosion resistance compared to any mounted unit offered today. Blocks are molded from a high grade of glass-filled thermoplastic polyester (PBT). 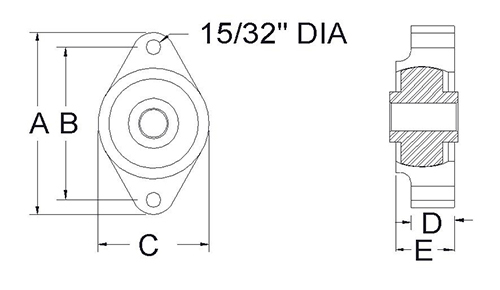 The block's spherical bore is machined for concentricity and proper fit of the insert bearing. The last step in manufacturing is machining the solid base for flatness. 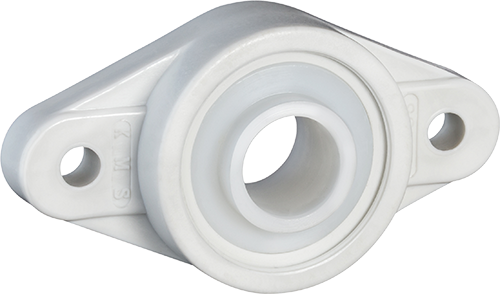 KMS produces insert sleeve type bearings made from UHMW-PE plastic. They are CNC machined from an extruded rod for superior mechanical performance and longer life. This type of bearing is intended primarily to reduce friction and permit free movement of turning parts. They are best suited for light to moderate loads and low speeds.